Harmony in music is playing different notes at once, that go together. It is usually two variations on the same melody, performed together. Harmonies have been used in singing at least since the middle ages. In metal, Iron Maiden is (arguably) most famous for extensive use of lead guitar harmonies with songs like The Trooper and Hallowed be Thy Name, but they have been/are being used by anyone from Thin Lizzy to Lamb of God. So how do you know which notes go together? Well, you can just use your ears, but that can be tricky. A harmonized version of a melody doesn’t sound like the original just with a higher or lower pitch – it sounds a little different. Some people can sing harmonies right off their heads, but I’m not there yet. I always “cheat” by using a bit of music theory to create my harmonies. I usually do thirds harmonies for my lead guitars. 1) Start with the rhythm, and identify which key it’s in. In the song sketch i used for my post on how to get a great metal tone with bass plugins, I’ve used A5, G5 and E5 for the verse riff. Since power chords (“5 chords”) aren’t really major or minor, we can choose to interpret the ones above as Am, G and Em, making the verse belong to the A minor key (or C major – those are the same). 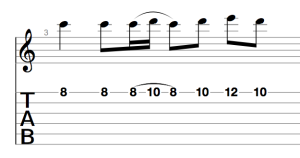 2) Using the key from your rhythm, choose a scale and create a lead melody or “lead riff”. I selected the natural minor scale, Aeolian. You can choose any scale, different scales give the melody different “moods”. The original lead melody looks like this. It starts on an A note and uses only notes from the A aeolian scale. 3) Here’s the A Aeolian scale mapped out onto a fretboard. You can see that the original melody uses notes 1, 2 and 3 (A, B and C) of the scale, corresponding to frets 10, 12 and 13 on the B string. 4) Record the original melody on a separate track. Apply effects to your liking, I’m using distortion and delay for my leads. Pan this track to the left. Either completely or something like 75 percent if you have rhythm guitars fully panned left. 5) Record the harmonized melody on a different track, and pan this to the right. Sometimes, the entire lead part isn’t harmonized, just a part at the end. For my example both left and right leads play the original melody for 8 bars and then they play original (left) and harmony (right) for 4 bars. There is nothing that says only lead guitar harmonies can be created, you can just as easily do it with rhythm guitars. Instead of doing a thirds harmony you can do a fourths harmony. Just go three steps up the scale instead of 2. This gives a different feeling to the harmony compared to when you use thirds. If you want to add a second harmony for a total of three lead guitar tracks, you can add a thirds harmony and a sixths harmony. This is very common in choir singing and works well with guitar leads as well. A sixths harmony is five steps up in the scale, or two steps down if that’s easier. Good luck, and as usual feedback and your own best tips on harmonizing in the comments!